In Africa lives a very unique animal. It has powerful front legs and a massive head that holds a set of jaws with the most powerful bite force of any land mammal. Highly intelligent and brave beyond measure, these animals are known to take food directly from the mouths of lions. Local legend suggests that witches ride on their backs at night and that the cackling can be heard for miles as they ride through the moonlight. One of Africa’s most successful predators, this animal doesn’t hunt every day, but it eats every day. 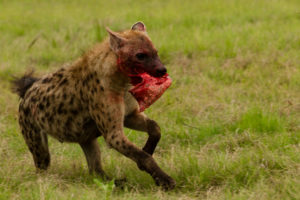 The Tonga people of the Zambezi call it “Suntwe”, The Hyena. Before I continue, let me tell you a bit about my background. 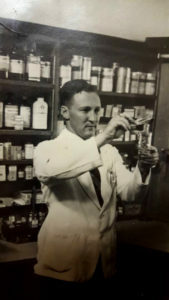 In mid 2003 I returned to Africa to join in the family Cosmetic Manufacturing business and while working there, under the supervision of my Pharmacist father, I studied to become a Cosmetic Chemist. I spent some good years in the business but I just couldn’t shake off that thirst for adventure. In 2012 that thirst had become an ache that wouldn’t subside. 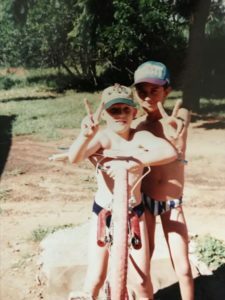 And while sitting with a good friend drinking a coke and talking about our mutual love of adventure, we came up with RAW Adrenaline. I saw RAW as an opportunity to combine my passion with my work by creating a lifestyle brand that would be by Adventure sports enthusiasts, for adventure sports enthusiasts. My buddy and I had slightly different ideas of how far we wanted to push it and he was already extremely committed in his primary work. So after 2 years he opted to pull out. It was a sad day when he told me. 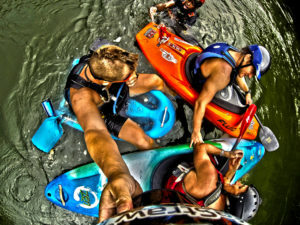 My friend was 10 years older than me and quite a legend that I really looked up to, but I have him to thank for introducing me to the world of whitewater kayaking. A sport that changed my entire life, a sport that consumed me, the sport that gave birth to “Suntwe”. Anyway, let’s get back on track. So where did the name “Suntwe” come from? Well, to fully understand this you need to understand that while working on the Zambezi not many people escape being nicknamed. 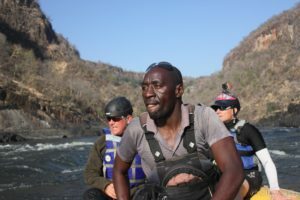 Spend a day rafting and you will quickly catch on that all the guides and safety kayakers have their own Zambezi nom de plumes and the stories behind each are as amusing as the next. Colgate, Pajero, Hippo, Nkume (Scorpion), ZhuZha (big man) and Sugar to name just a few! All nicknames with some great stories behind each one. But again, those are stories for another day. It was somewhere in the low water season of 2013 that Nkume started referring to me as “Suntwe”. 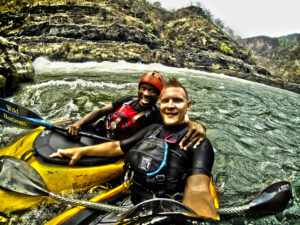 Coincidentally, Nkume was also the guide that took me on my very first rafting trip and it was his passion and energy for what he did that inspired me to start kayaking. There are a few rumours on how I actually earned the name Suntwe. Some of the kayakers may tell you that the name came about because whenever there were “interesting clients” rafting, I would circle the raft in my kayak like a hungry hyena waiting to for an opportunity to steal the “meat” (limelight), from the “Lion”(Raft guide). I can’t deny that I love a good audience and that I do enjoy centre stage so from that point of view there is an element of truth to it. Others might tell you it has to do with my hair cut and some might say it’s because I have a face only a mother could love. But, the real reason for my name is my ridiculous laugh. Anyone that has had the unfortunate opportunity to hear me laugh will attest to the fact that this is not the kind of sound that should be emanating from a grown man’s mouth under any circumstances. It starts as a high pitched giggle and evolves into a manic cackle depending on the severity of the humour being experienced and sounds remarkably like the sound of an indecisive, curious Hyena. I also developed a signature celebratory call that seems to automatically escape from my throat whenever I survive a beatering on the river or make clean lines. This call is a loud Hoo-wee! And sounds a bit like the call a hyena gives off at night to assert its territory. After a while I started to notice that when I walked through town or surrounding villages, people would shout this hyena call in my direction as a greeting and before I knew it the sound had become the standard greeting between me and most of the communities in and around Victoria falls. It was especially embraced by the Zambezi porters and villagers in the Monde, Dibu dibu, Chisuma and Jembwe areas. Clients and rafting pax are often amused at the medley of Hoo-wee’s that greet me each day as I summit the gorge after a day on the river or as we drive back into town and are greeted by the people going about their day in the bustling metropolis of Vic Vegas. It is a sound I have grown to love for many reasons. Every time I hear that sound I know I am not alone. I know that there are people out there that love and support me. We all have those people, but that sound reminds me and has often helped me through some of the harder times. The nickname that started as a playful term of endearment has become a badge of honour that I wear proudly. It reminds me that we are all part of the bigger whole and that we each have a responsibility to each and every individual we interact with to inspire the spirit of “Ubuntu”. When we embrace our interconnectedness we soon realise that there is no separation and that we exist in a perfect symbiosis with all. In closing I would just like to share with you my own mandate for life. Three simple words. Explore, create, Inspire…….. Explore : This is a process of self discovery. A process of finding ones true self and expressing it without apology. Create : Use each second to create memories, relationships and goodness in the world and build others up to the same. Inspire : Stand in your truth and be uncompromising about it and in so doing give others the space to do the same. Change the world one person at a time…Starting with yourself. You inspire me!! This is fantastic! I Can’t wait to read more! I’m loving the introduction….. can’t wait for more!! The second one is up…hope you enjoy ! Enjoyed reading…Thank you for the link Paul.